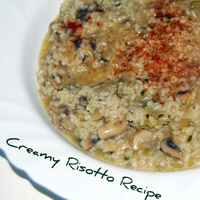 You don't have to look too far on the Italian Mediterranean for a mouth watering risotto recipe. Actually, contrary to popular opinion, they are not difficult to make at all. Start with our tasty, quick and easy basic recipe, afterwards there are many variations you can try, by adding different ingredients. 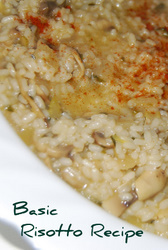 We will be adding more similar delicious risotto's soon, so keep an eye out for them. OK - fry the onion and celery in the olive oil in a medium sized heavy based pan (that has a lid) over a medium heat, until they are translucent. Add the mushrooms, if using, and continue to cook for 2 minutes and then add the garlic turning the heat down so that it cooks gently for 2-3 more minutes. Add the butter , parmesan and parsley and stir till evenly mixed and melted into the rice. Serve immediately with extra parmesan if desired and a green dressed salad.